Food brings people together – what is likely more accurate is that people with food bring people together. Apostle No. 2 is a genuine connector, supporting the work of many along the way and, often times, convening them around tables to eat, drink and converse. Although this project revolves around the story of an epic dinner, Andre and I did not enter it intending to host a Last Supper; as the effort evolved past a simple table to a more complex public art project, a dinner became increasingly fitting. Like our approach to lumber, we started at the source: find the farm to find the food. We discovered Food Field, just blocks from our home and surprisingly unknown to us until this project. Noah Link walked us through his farm and led us to Chef Meiko Krishok of Guerrilla Food. Apostle No. 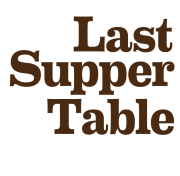 2 we are grateful for your support of the Last Supper – you were on board before we understood what it even was. Thank you. This entry was posted in All Posts and tagged Apostles, ArtPrize, Detroit, Food Field, Grand Rapids, Guerrilla Food, Last Supper Table, support by Abir. Bookmark the permalink.